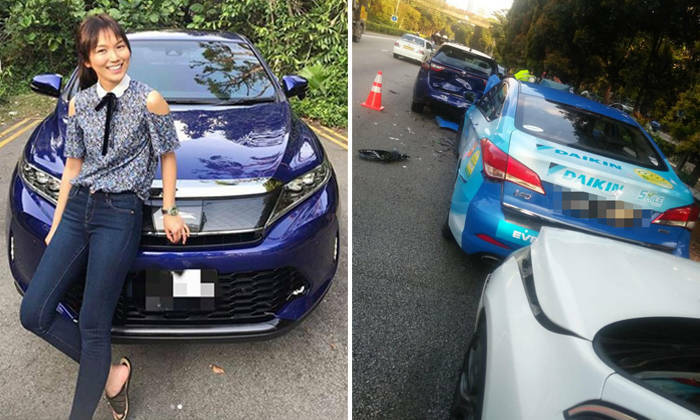 Local celebrity Joanne Peh was involved in a traffic accident while on her way to filming on Wednesday (Sep 26), but what left her in disbelief was people soliciting for business at the scene. The 35-year-old actress said in an interview with Wanbao on Thursday morning (Sep 27): “Almost immediately the accident occurred, someone came forward to provide their name card and show us concern, even offering services for car repairs and insurance claims. Peh, who said that she was physically fine, will return to work on Friday (Sep 28) after two days of home rest. She added: “My neck and back are aching more than they did yesterday, but there are no other superficial injuries. She was also quoted by Mediacorp’s The Celebrity Agency on Instagram as saying: “Thank you everyone for your concern. Peh’s agent, parents and younger brother visited her in hospital after the accident, while her husband Qi Yuwu, who is away filming in China, has been informed.